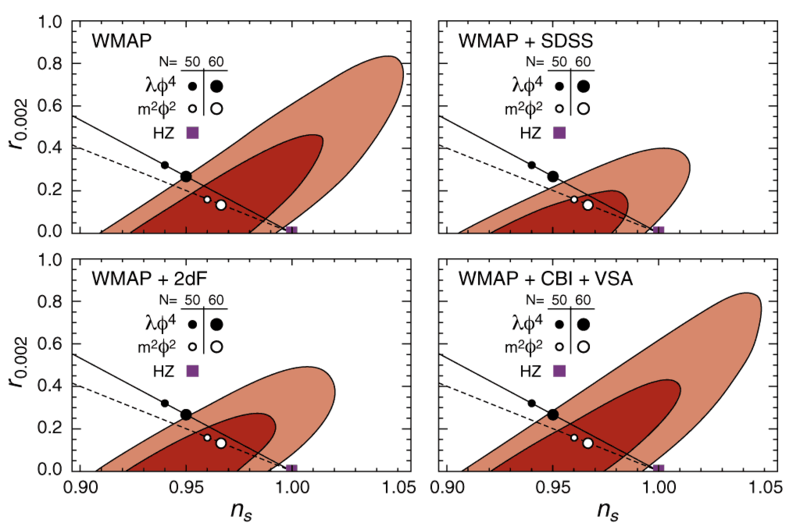 WMAP Three-year Paper Figures, Spergel et al. The improvement in parameter constraints for the power-law ΛCDM model (Model M5 in Table 3). The contours show the 68% and 95% joint 2-d marginalized contours for the (Ωmh2, σ8) plane (left) and the (ns, τ) plane (right). Comparison of the predictions of the different best fit models to the data. 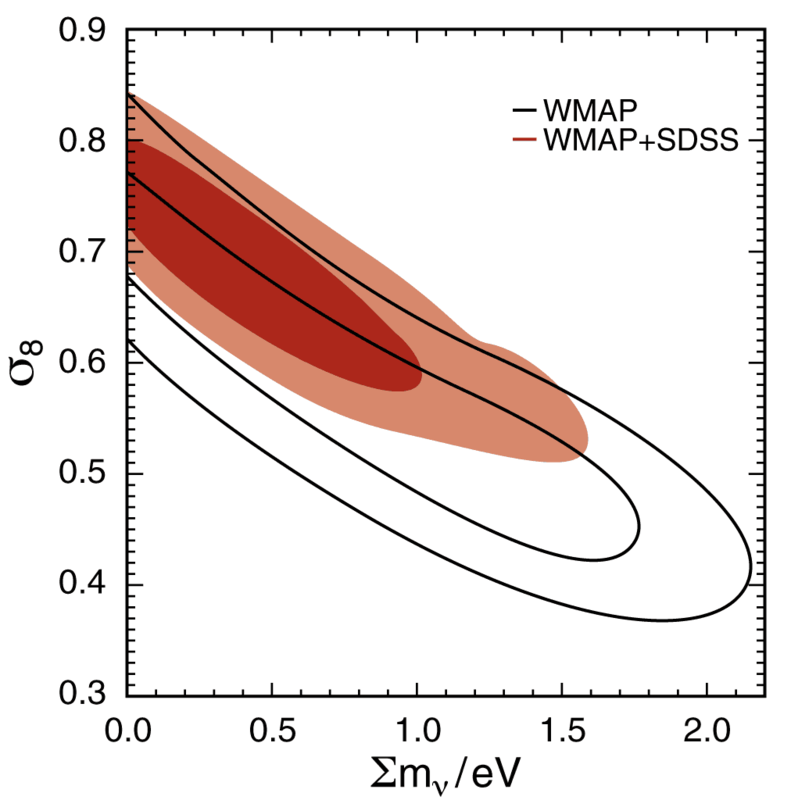 The black line is the angular power spectrum predicted for the best fit three-year WMAP only ΛCDM model. The red line is the best fit to the 1-year WMAP data. 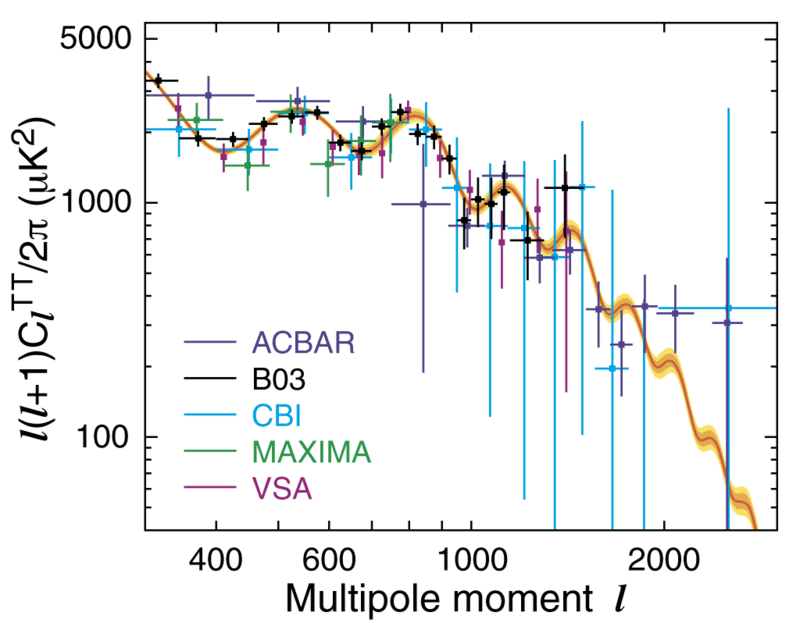 The orange line is the best fit to the combination of the 1-year WMAP data, CBI and ACBAR (WMAPext in Spergel et al. (2003)). 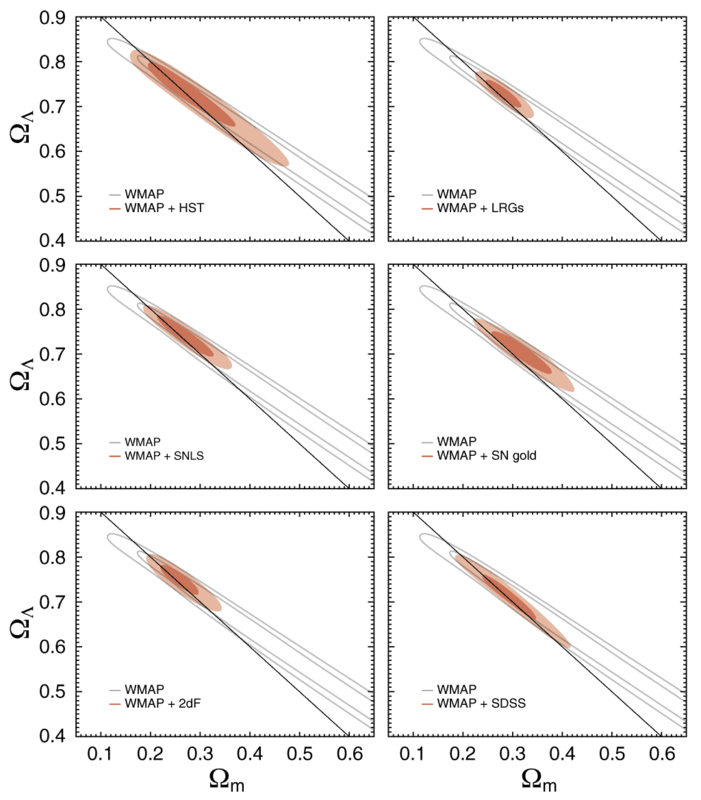 WMAP constraints on the reionization history. 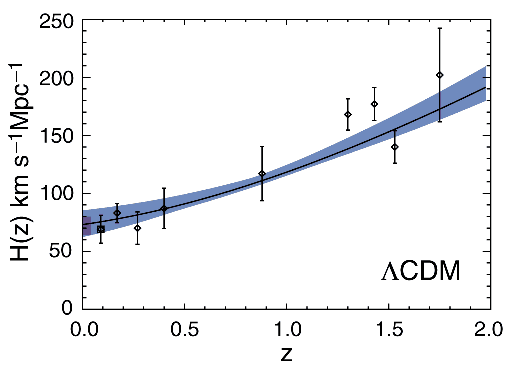 (Left) The 68% and 95% joint 2-d marginalized confidence level contours for x0e-zreion for a power law Λ Cold Dark Matter (ΛCDM) model with the reionization history described by equation 3 and fit to the WMAP three year data. 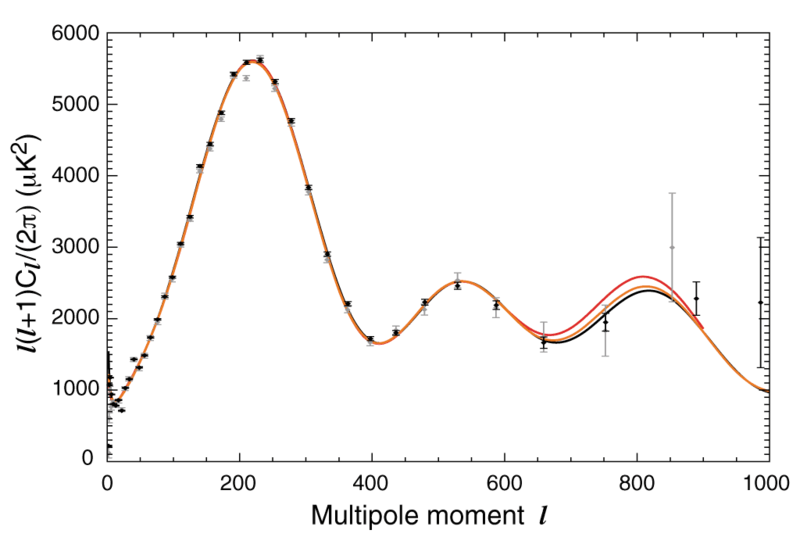 The ΛCDM model fit to theWMAP data predicts the Hubble parameter redshift relation. 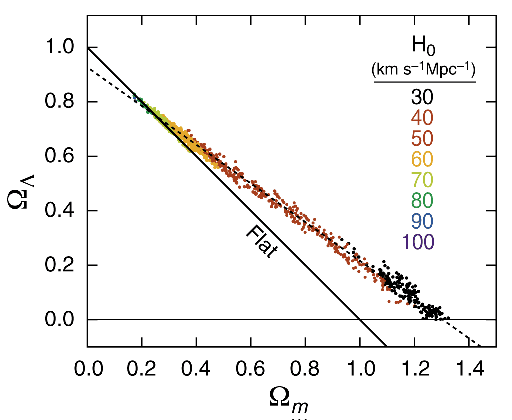 The blue band shows the 68% confidence interval for the Hubble parameter, H. The dark blue rectangle shows the HST key project estimate for H0 and its uncertainties (Freedman et al. 2001). 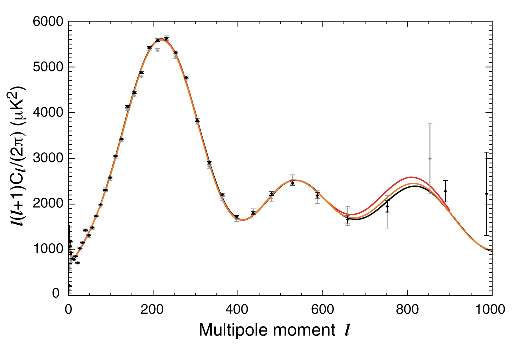 The prediction for the small-scale angular power spectrum seen by ground-based and balloon CMB experiments from the ΛCDM model fit to the WMAP data only. The colored lines show the best fit (red) and the 68% (dark orange) and 95% confidence levels (light orange) based on fit of the ΛCDM model to the WMAP data. 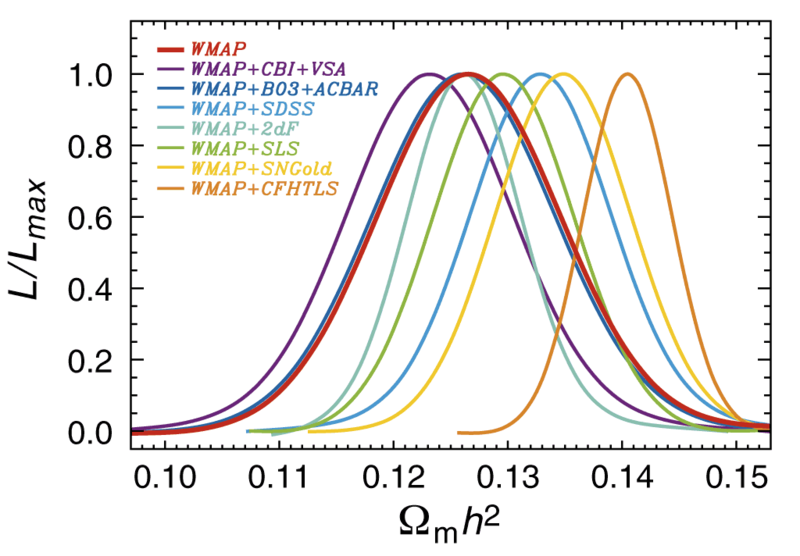 (Left) The predicted power spectrum (based on the range of parameters consistent with the WMAP-only parameters) is compared to the mass power spectrum inferred from the SDSS galaxy power spectrum (Tegmark et al. 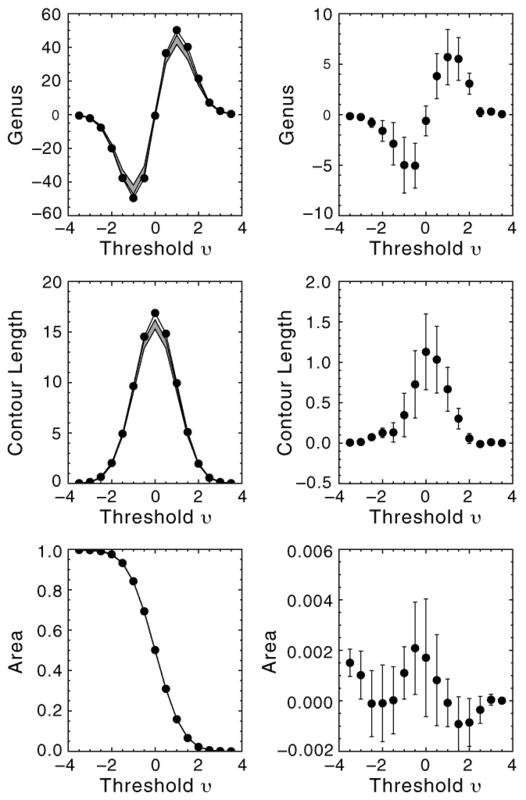 2004b) as normalized by weak lensing measurements (Seljak et al. 2005b). 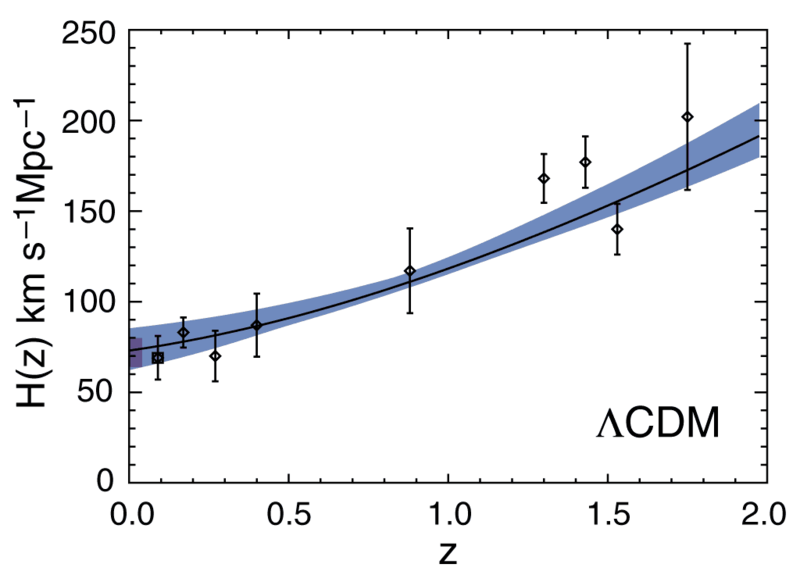 (Right) The predicted power spectrum is compared to the mass power spectrum inferred from the 2dFGRS galaxy power spectrum (Cole et al. 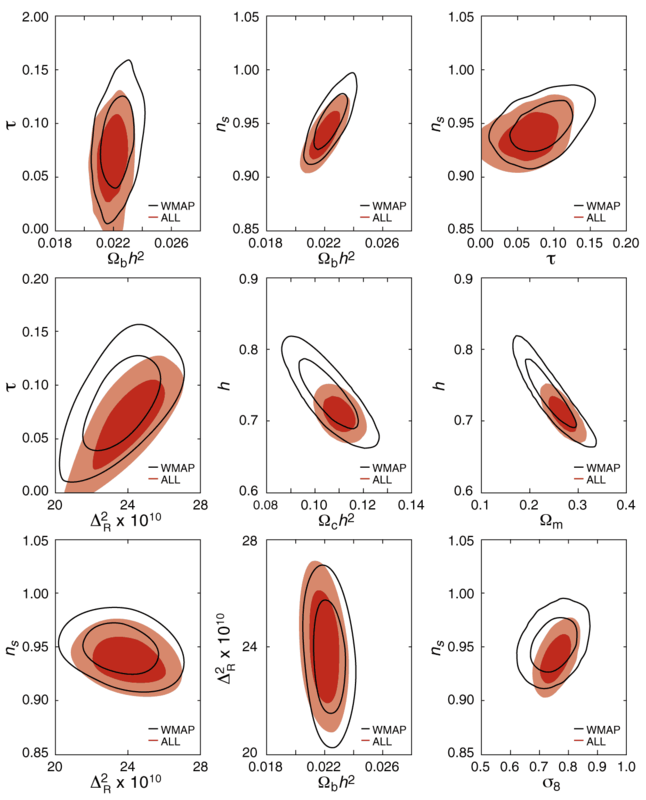 2005) with the best fit value for b2dFGRS based on the fit to the WMAP model. 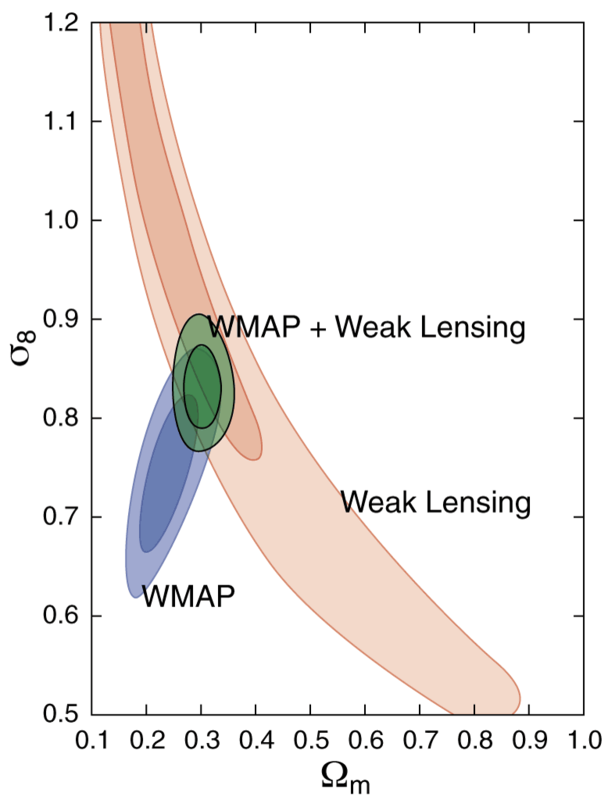 Prediction for the mass fluctuations measured by the CFTHLS weak lensing survey from the ΛCDM model fit to the WMAP data only. The blue, red and green contours show the joint 2-d marginalized 68% and 95% confidence limits in the (σ8, Ωm) plane for for WMAP only, CFHTLS only and WMAP+CFHTLS, respectively, for the power law ΛCDM models. 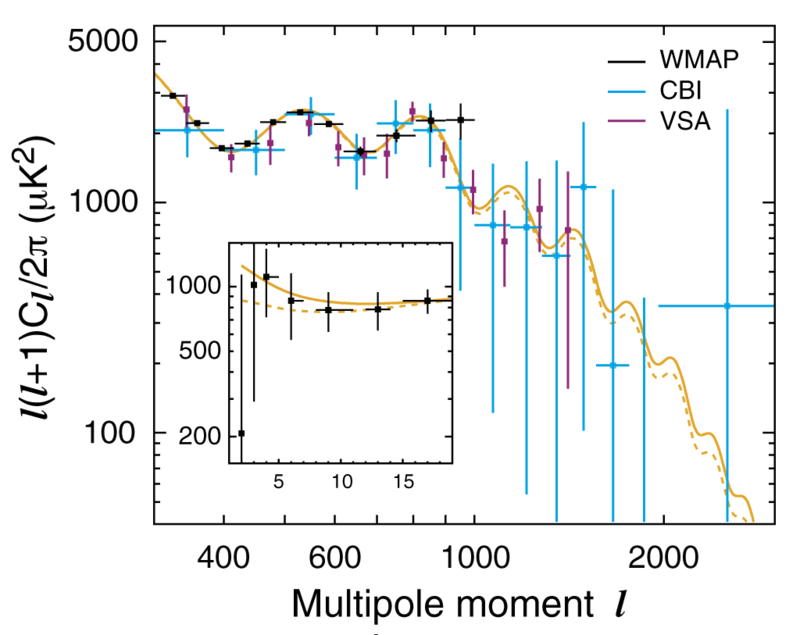 Using the WMAP ΛCDM parameters, we predict luminosity distanceredshift relationship and compare it to measurements from supernova surveys. 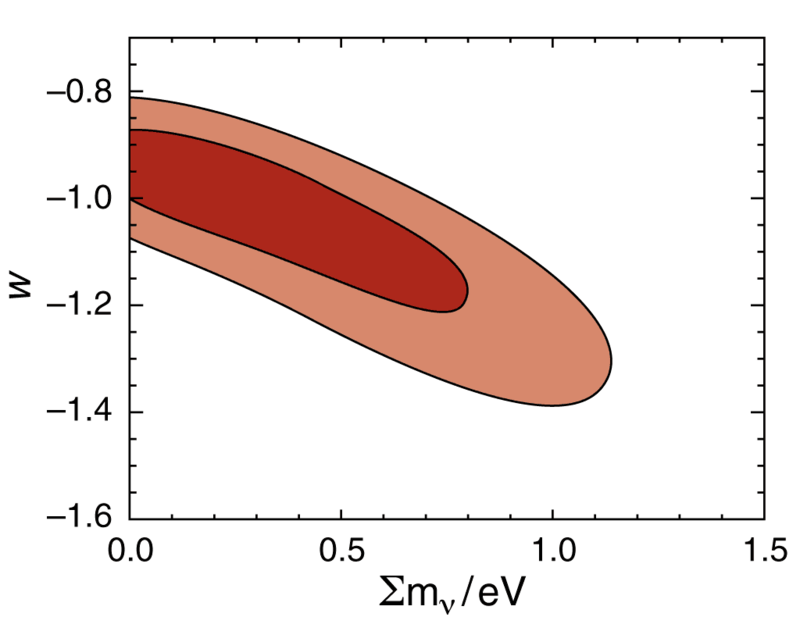 The plots show the deviations of the distance measure (DM) from the empty universe model. 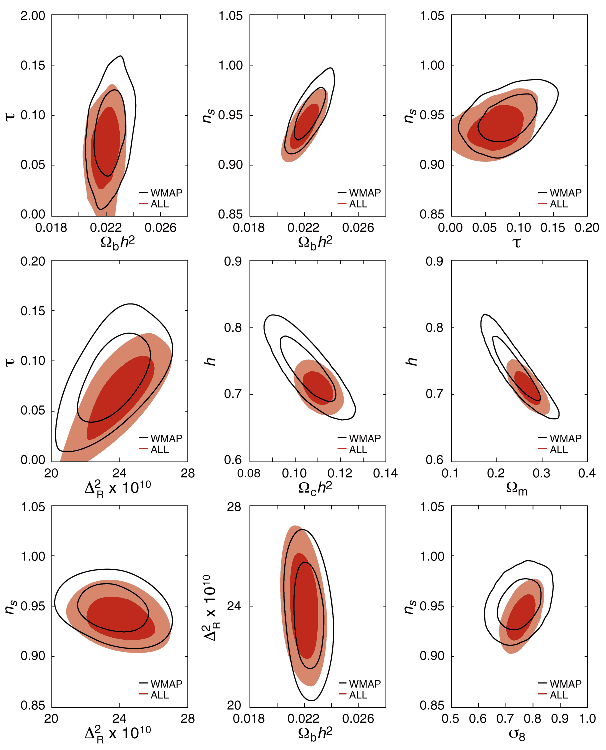 One-dimensional marginalized distribution of Ωmh2 for WMAP, WMAP+CBI+VSA, WMAP+BOOM+ACBAR, WMAP+SDSS, WMAP+SN(SNLS), WMAP+SN(HST/GOODS), WMAP+2dFGRS and WMAP+CFHTLS for the power-law ΛCDM model. 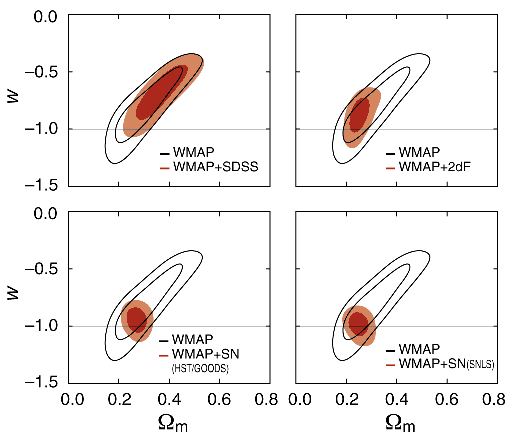 Joint two-dimensional marginalized contours (68%, and 95% confidence levels) for various combination of parameters for WMAP only (solid lines) and WMAP+2dFGRS+SDSS+ACBAR+BOOMERanG+CBI+VSA+ SN(HST/GOODS)+SN(SNLS) (filled red) for the power-law ΛCDM model. 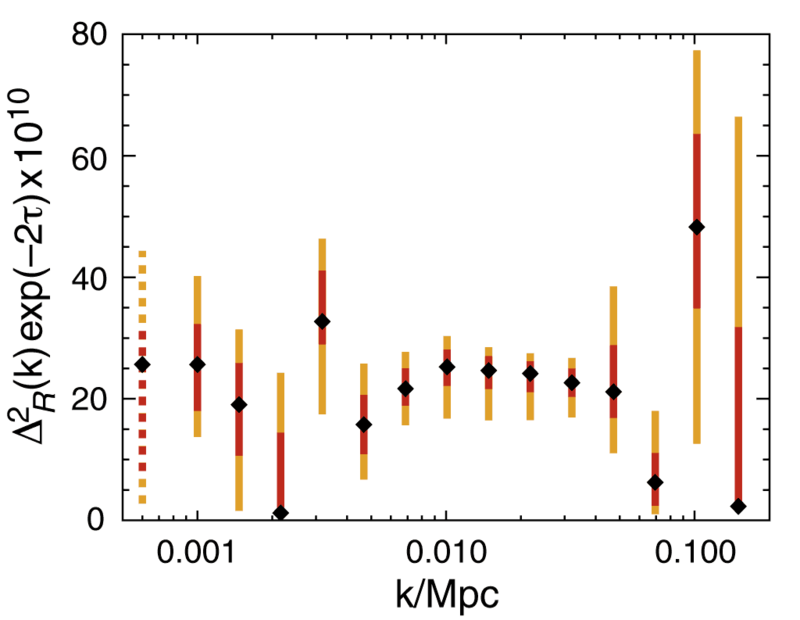 The reconstructed primordial curvature fluctuation spectrum, ΔR2(k), for a ΛCDM cosmology, in logarithmically spaced k bins, where k is in Mpc-1. The errors show the 68% (red) and 95% (orange) constraints and the black diamonds the peak likelihood value. 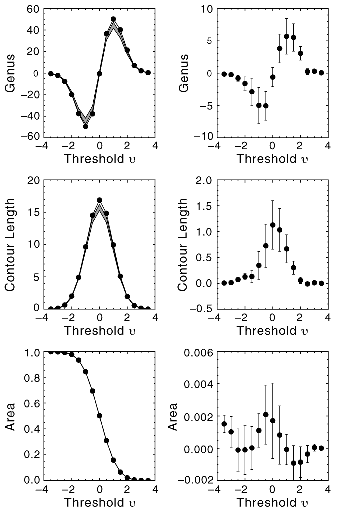 Joint two-dimensional marginalized contours (68% and 95%) for inflationary parameters, (r, ns) (left panel) and (r, dns/d ln k) (right panel), for Model M11 in Table 3, with parameters defined at k = 0.002 Mpc-1. (Upper) WMAP only. 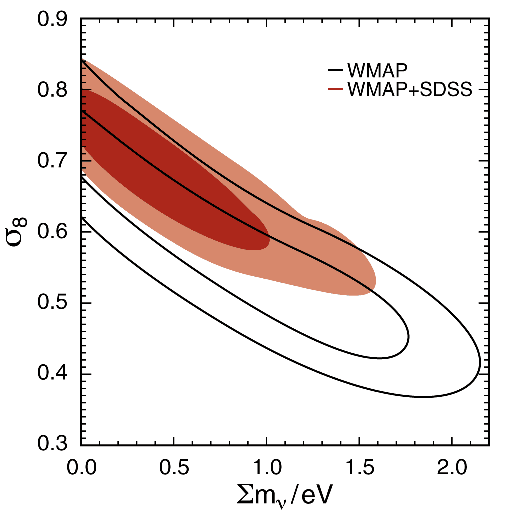 (Middle) WMAP+SDSS. (Bottom) WMAP+CBI+VSA. The running spectral index model provides a slightly better fit to the data than the power-law spectral index model. 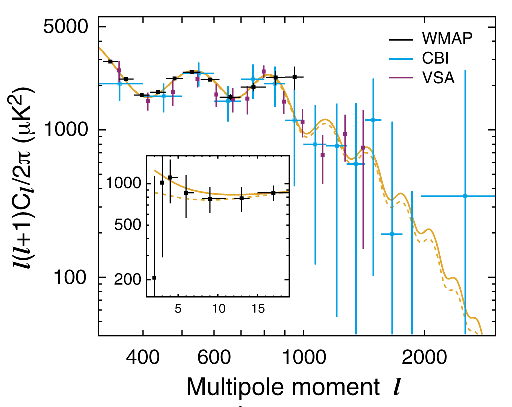 The solid line shows the best fit power law ΛCDM model and the dashed line shows the best fit running spectral index ΛCDM model (fit to WMAP+CBI+VSA). 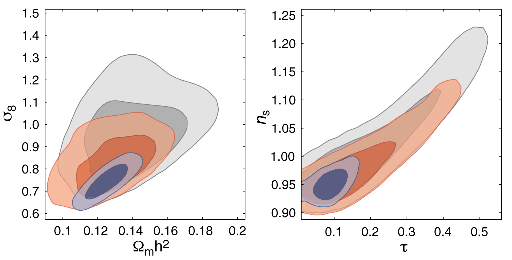 Joint two-dimensional marginalized contours (68% and 95% confidence levels) for inflationary parameters (r0.002, ns). We assume a power-law primordial power spectrum, dns/d ln k = 0, as these models predict a negligible amount of running index, dns/d ln k ≈ -10-3. 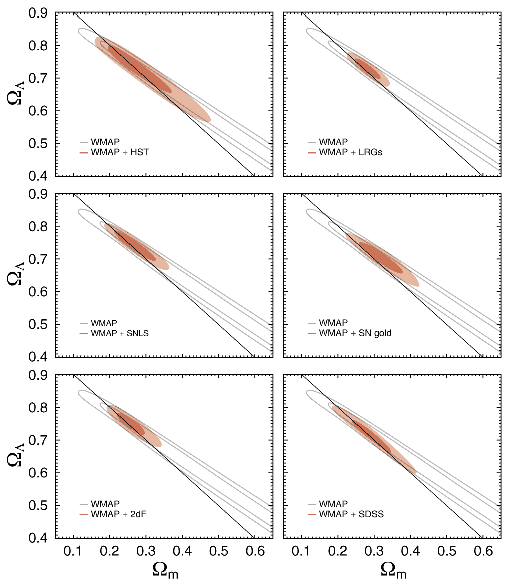 Constraints on w, the equation of state of dark energy, in a flat universe model based on the combination of WMAP data and other astronomical data. We assume that w, is independent of time, and ignore density or pressure fluctuations in dark energy. 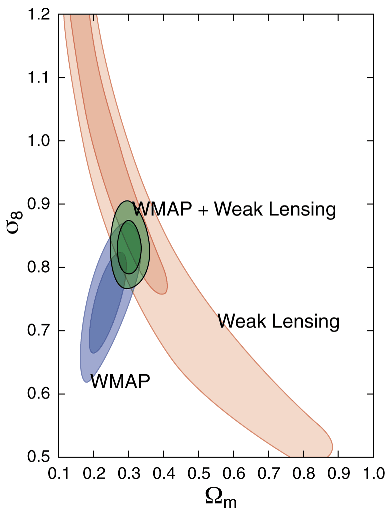 Constraints on w, the equation of state of dark energy, in a flat universe, Model M6 in Table 3, based on the combination of WMAP data and other astronomical data. We assume that w is independent of time, but include density and pressure fluctuations in dark energy with the speed of sound in the comoving frame equal to the speed of light, c2s=1. Constraints on a non-flat universe with quintessence-like dark energy with constant (Model M10 in Table 3). 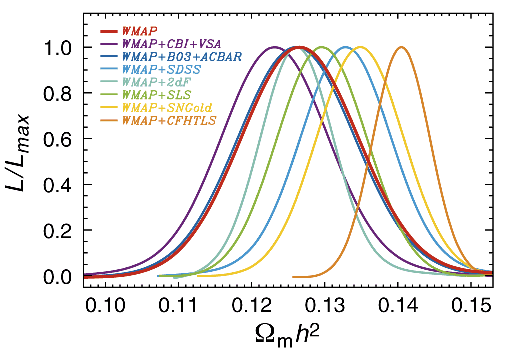 The contours show the 2-d marginalized contours for w and Ωk based on the the CMB+2dFGRS+SDSS+supernova data sets. Constraints on a flat universe with quintessence-like dark energy and non-relativistic neutrinos. 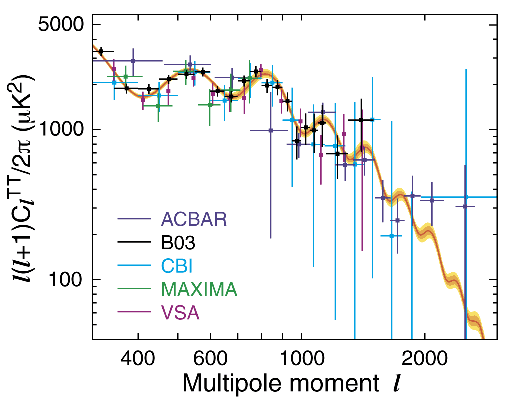 The contours show the 2-d marginalized constraints on the mass of non-relativistic neutrinos, mν, and the dark energy equation of state, assumed constant, based on the the CMB+2dFGRS+SDSS+supernova data sets. 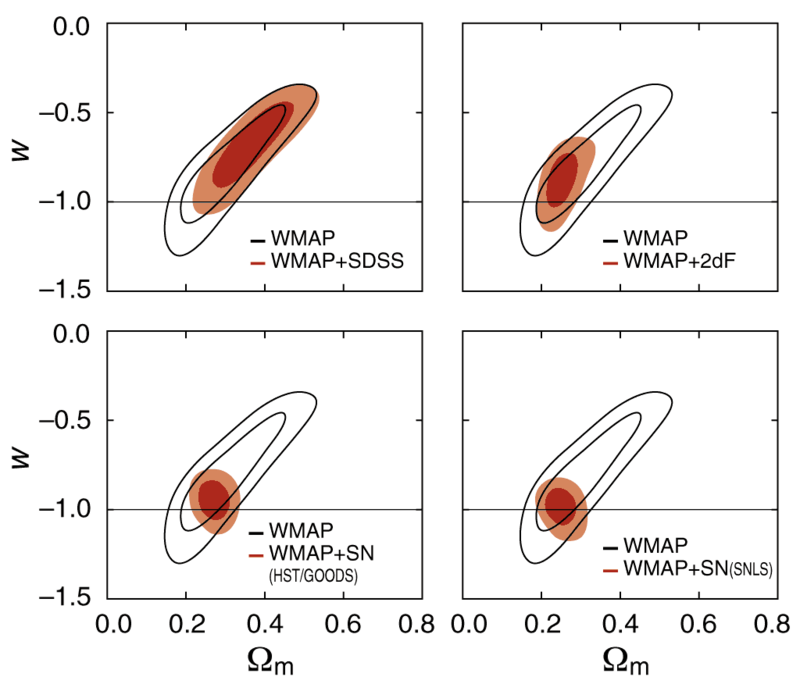 Joint two-dimensional marginalized contours (68% and 95% confidence levels) on(σ8,mν) for WMAP only, Model M7 in Table 3, and WMAP+SDSS. 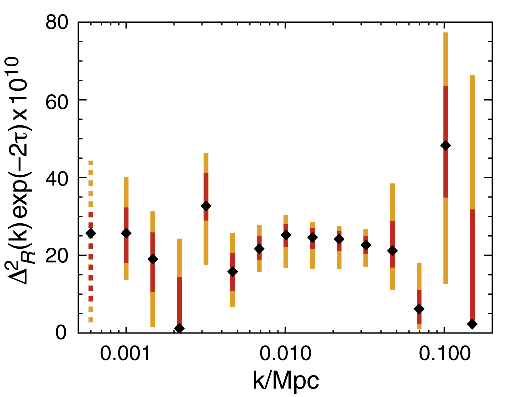 By measuring the growth rate of structure from z = 1088 to z ≈ 0, these observations constrain the contribution of non-relativistic neutrinos to the energy density of the universe. 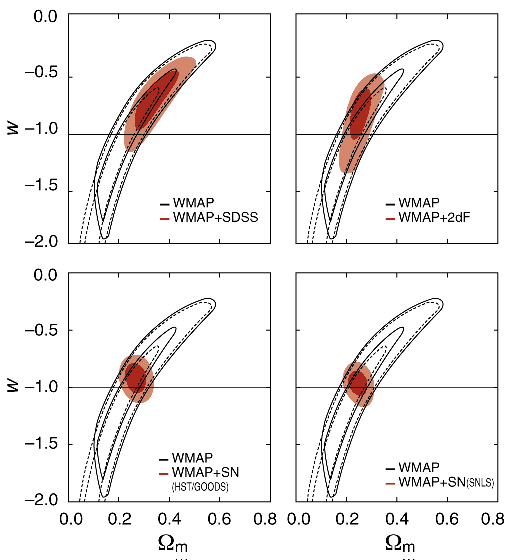 Range of non-flat cosmological models consistent with the WMAP data only. 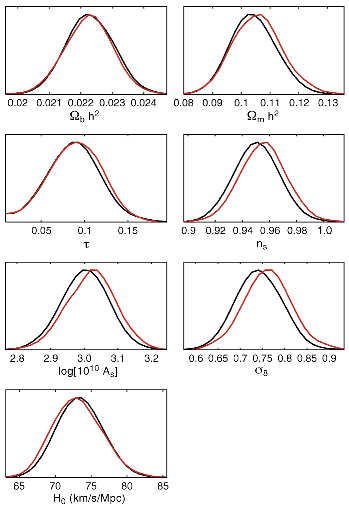 The models in the figure are all power-law CDM models with dark energy and dark matter, but without the constraint that Ωm+ΩΛ = 1 (model M10 in Table 3). 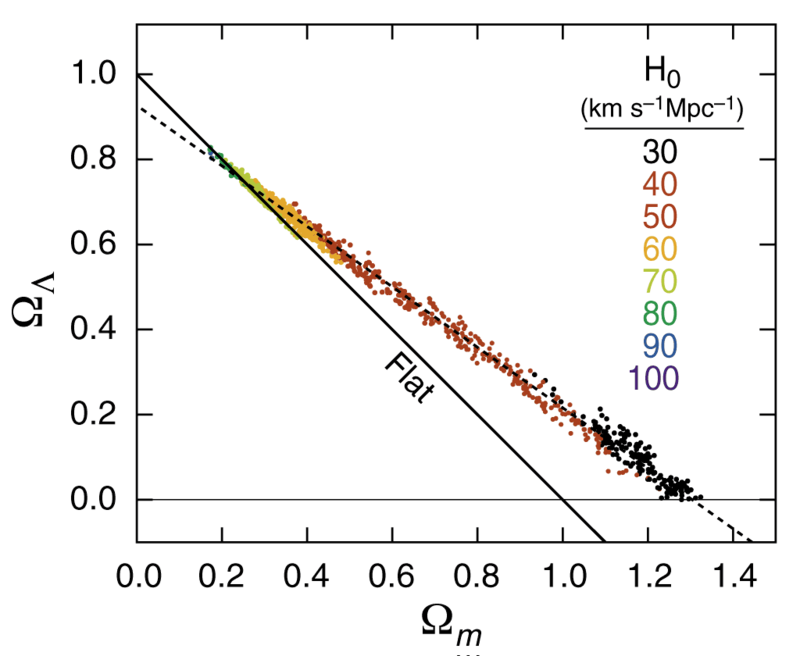 The different colors correspond to values of the Hubble constant as indicated in the figure. 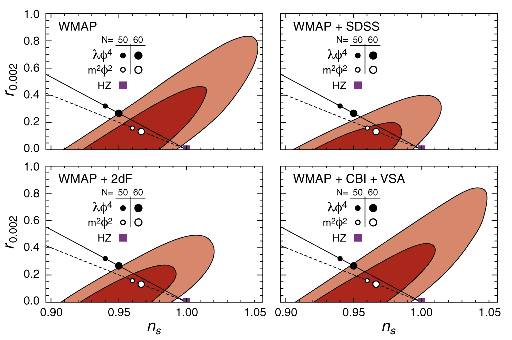 Joint two-dimensional marginalized contours (68% and 95%) for matter density, Ωm, and vacuum energy density, ΩΛ for power-law CDM models with dark energy and dark matter, but without the constraint that Ωm+ΩΛ=1 (model M10 in Table 3). 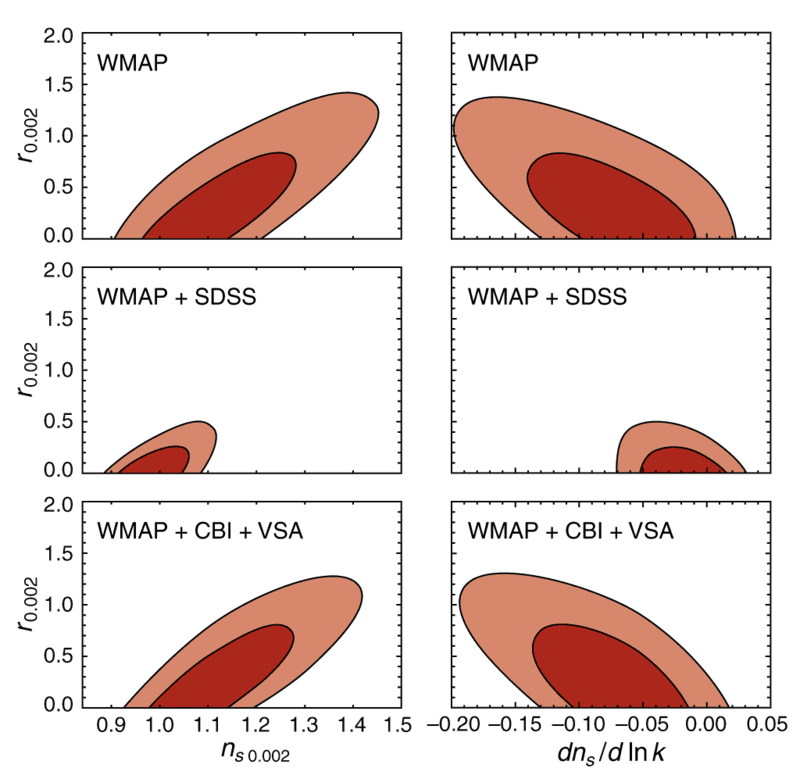 The panels show various combinations of WMAP and other data sets. 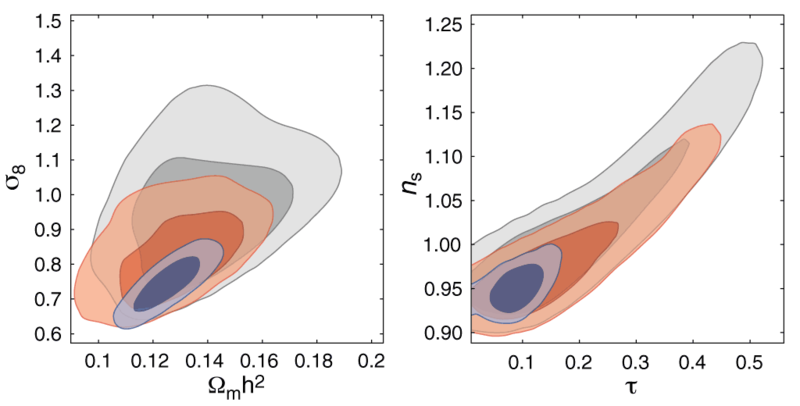 Normalized one point distribution function of temperature anisotropy, defined in equation (17), for the template-cleaned Q (left), V (middle) and W (right) band maps outside the Kp2 cut. 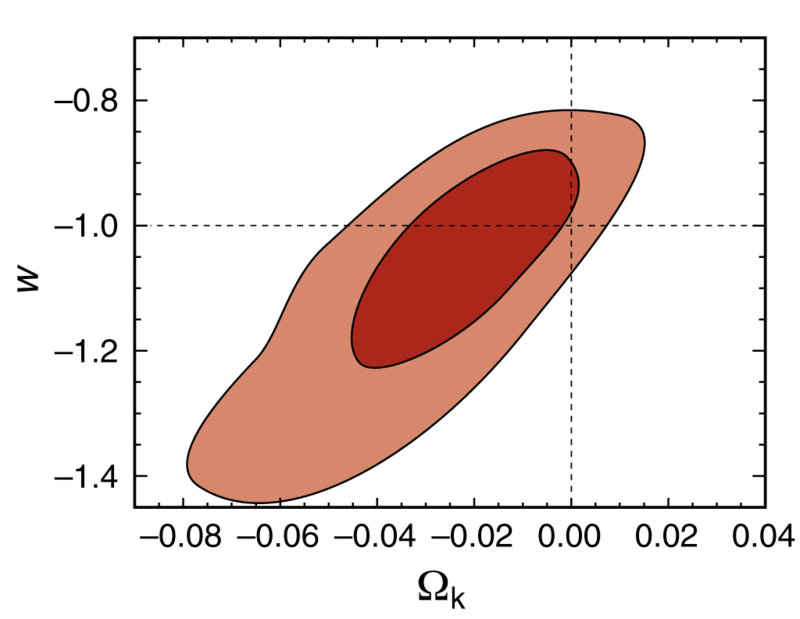 Normalized one point distribution function of temperature anisotropy, defined in equation (17), for the template-corrected V band data maps outside the Kp0 cut. 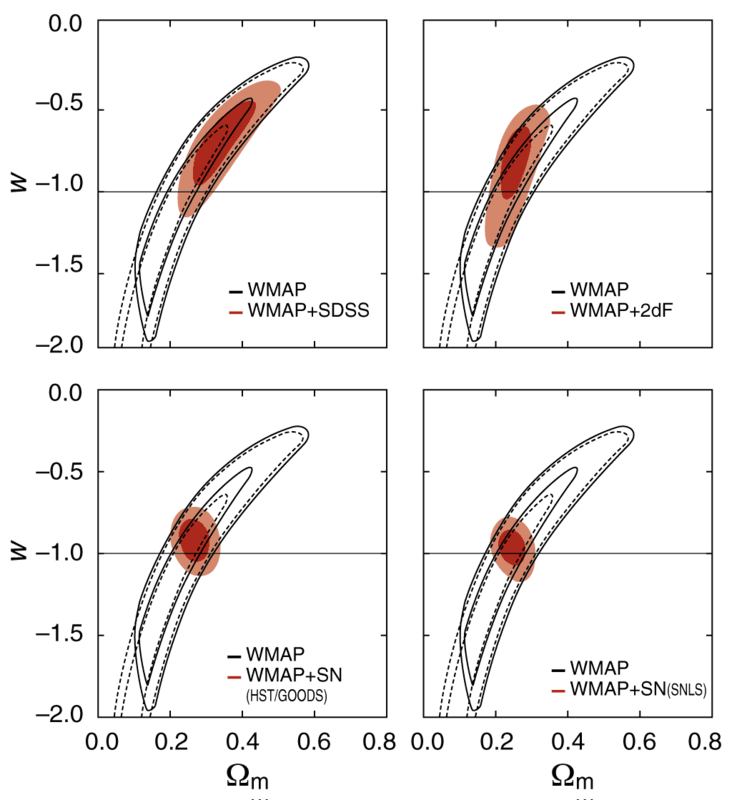 The WMAP data are in excellent agreement with the Gaussian simulations based on the analysis of the Minkowski functionals for the three year WMAP data outside the Kp0 cut. Constraints on the amplitude of the four point function. 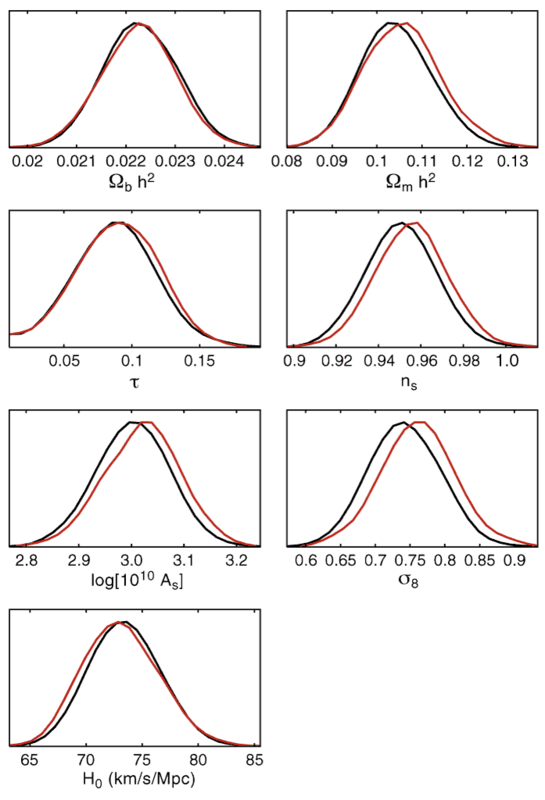 The measured amplitude of the four point function (expressed in terms of a non-Gaussian amplitude defined in equation (23)) is compared to the same statistic computed for simulated Gaussian random fields. 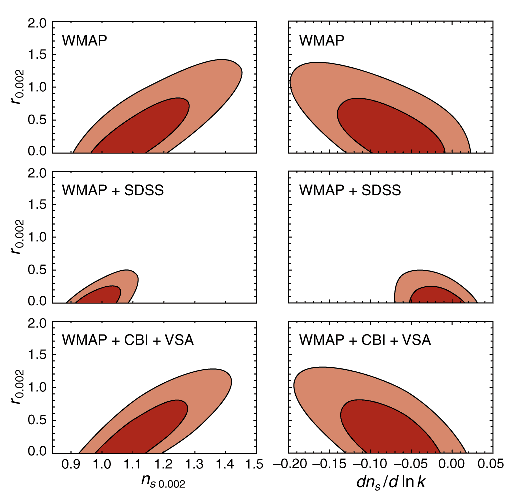 The effect of SZ marginalization on the likelihood function. 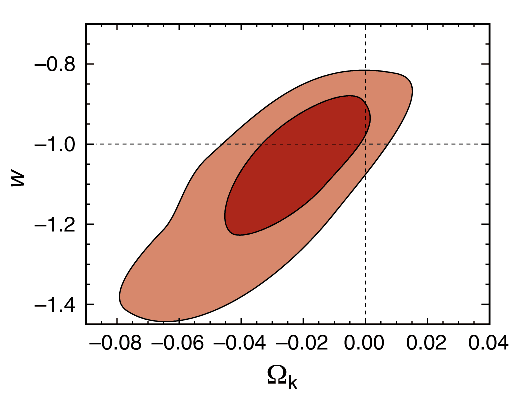 The red curve is the likelihood surface for the three-year WMAP data for the power-law ΛCDM model with ASZ = 0. 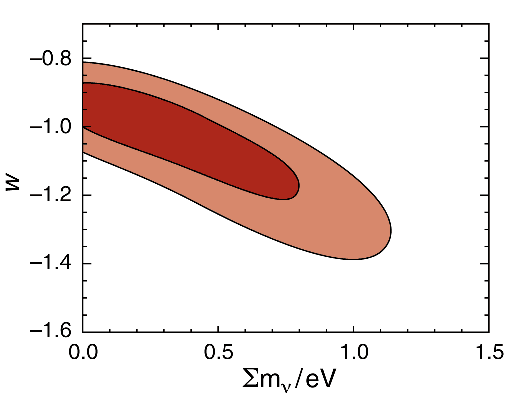 The black curve is the likelihood surface after marginalizing over the amplitude of the SZ contribution.